This slim, sturdy USB 3.1 Gen 1 (5 Gbps) cable, also known as a USB 3.0 cable, lets you position Micro-USB devices on your desk without the cable getting in the way. It’s thinner and more flexible than standard cables, and features a right-angled Micro-USB connector that prevents awkward bends at the connection port. This versatile cable features a right-angled connector, which offers a more natural fit at the device connection point and helps prevent unnecessary strain and damage to the port. The cable features a thin, yet sturdy connector molding, so you’ll be able to connect to your phone or tablet without removing its protective case. Plus, the cable’s right-angled Micro-USB connector lets you text, work or game on your mobile device even while it’s charging, without the cable getting in the way. 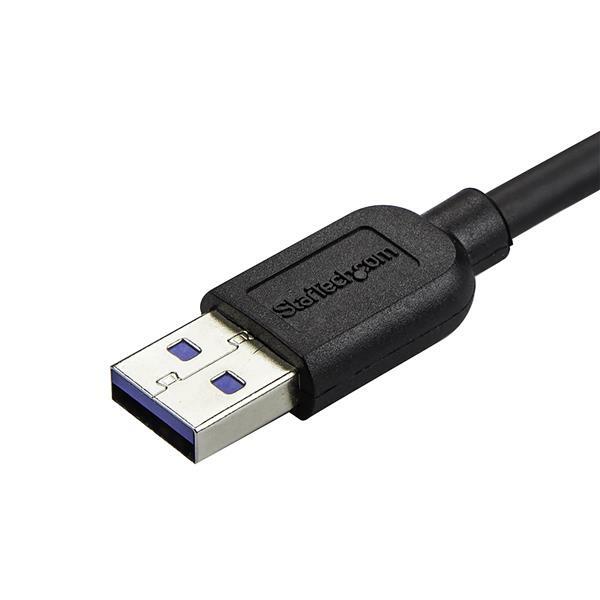 The USB3AU1MRS 1-meter cable is backed by StarTech.com’s lifetime warranty for guaranteed reliability.